German solar power plants produced a world record 22 gigawatts of electricity – equal to 20 nuclear power stations at full capacity – through the midday hours of Friday and Saturday, the head of a renewable energy think tank has said … Norbert Allnoch, director of the Institute of the Renewable Energy Industry in Muenster, said the 22 gigawatts of solar power fed into the national grid on Saturday met nearly 50% of the nation’s midday electricity needs. That’s right—half of all of Germany was powered by electricity generated by solar plants. That’s incredible. It was also world record-breaking. Germany is pretty much singlehandedly proving that solar can be a major, reliable source of power—even in countries that aren’t all that sunny. 100% of Minnesota’s electricity generation needs can be met by wind and solar sources combined with improvements to the state’s electric grid system and energy efficiency policies, according to a report released today. Researched and written by Dr. Arjun Makhijani and Christina Mills of the Institute for Energy and Environmental Research (IEER) and Dr. M.V. Ramana of Princeton University. Minnesota’s electricity sector currently accounts for over one third of the state’s greenhouse gas emissions. State policy is to reduce emissions by 80% by 2050. The notion that solar and wind energy cannot be the mainstay of an electricity generation system because they are intermittent is incorrect…it is technically and economically feasible to meet the entire 2007 electricity demand of Xcel Energy [in Minnesota] using only renewable energy generation combined with storage technology and energy efficiency improvements. The renewable energy mix would include approximately 13,000 megawatts of wind power and 4,600 megawatts of distributed solar PV…would pump more than $90 billion into the state’s economy and create 50,000 jobs. With the combination of new renewable energy and significant energy efficiency, electricity rates rise slightly but Minnesota ratepayers are held relatively harmless. 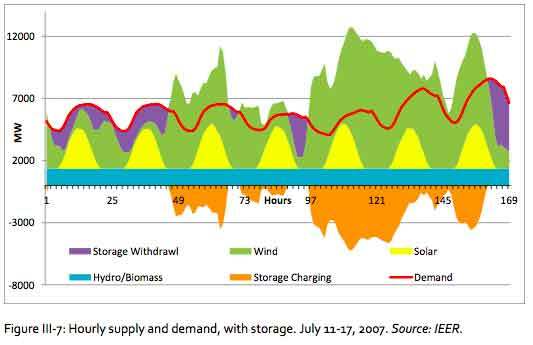 The conventional notion of a “peak load” needs to be replaced in designing an electricity system with a high proportion of solar and wind energy…The crunch time may be during periods when the wind and solar supply are low relative to demand. My favorite new term. It refers to using existing energy sources (solar, wind, geothermal, thermo) and turning them into electricity to feed the grid. Pretty much covers all the new energy sources. Excludes coal, nuclear, etc. Apparently, its just a dream. Obama is pushing it and so is Energy Secretary, Steven Chu. All reasonable folk expect this is to be the foundation of our energy future. Without a modern grid we have no hope of utilizing the latest innovations. It would be like giving jet fuel to a horse drawn carriage. Future, hah!, says the wizened gentleman behind me. He begins to explain his reaction after telling me he left the business and is only attending this seminar for nostalgia purposes. Suspect. He relates that the grid is already smart on a macro level. Utilities know how to share power, monitor, and get it to needed locations. What we are talking about is the micro level and involves pushing that technology to every city, home, and building. An expensive feat that will probably never result from government or utility spending. More to be explained on that in following section. What is a big deal then? Energy storage on the grid. If we are over-producing solar power in hot deserts and wind power at night, where will at all go. Our current infrastructure does not have an ability to use/transport/store this energy supply. If we can figure out a way to get the energy to high population areas then our grid will be smart. This is where the real change is happening. Power outlets with remote controls. Home appliances with timers. Motion sensors. Sleep modes for computers. All of these involve the new energy monitoring lifestyle. They give us an opportunity to take control of our energy use. A lot of us want more and this where smart metering comes into play. Hook up all those devices to a software package and you get data heaven. Charts, graphs, recommendations. This seems to be where the juice is (pardon the pun). Google is offering a software package, called Power Meter, and partnering with Energy, Inc. Their product, the TED5000, has been flying off the shelves for over a year now. It appears that this version of the smart grid, one that is decentralized and at the individual level will be driving the market for years to come. Photovoltaic production has been doubling every 2 years, increasing by an average of 48 percent each year since 2002, making it the world’s fastest-growing energy technology. At the end of 2008, the cumulative global PV installations reached 15,200 megawatts. As the investments ramp up the technological innovation is booming. Folks with pent up projects are finally getting dollars (or more likely Yuan) to operationalize their theories. A big group of these innovations are centered around ultra-thin, low cost solar arrays. Instead of the bulky flat panels we will get complex micro solar panels with interesting features like: solar tracking (panels follow the sun), economies of scale (driving down cost), and mirrors (increasing efficiency through reflecting). Our presenter mentioned that these second generation panels have the capability to drive down costs to match that of nuclear and coal power. This one feels more like a laboratory study than a real consumer product. Still their are companies releasing this on the market and our presenter even said that it is in calculators now. This grouping of PV focuses on the materials used to create solar panels. Searching for organic, nano, and molecular replacements for the raw materials (silicon, cadmium, lithium) that we use now. Definitely a major need since many of the raw materials used for solar panels are rare and sometimes for rogue states. Touched on this a bit before. It boils down to a maximum reached by first generation solar panels. For many years their maximum solar to electrical conversion was 20%, with 80% lost/wasted. In comparison to coal and nuclear, which are 60-70%, this makes solar 3x as expensive and require 3x as many panels/turbines/etc. The 2/3rd generation technologies mentioned above easily breach the 20% ceiling. One already at 35% through stacking panels, utilizing off band (UV) rays, and mirrors. I expect it wont be long until that number is doubled. Not in my backyard. This is representing a real problem. In the coming years we will ‘plant’ thousands of solar panels and wind turbines. Few are happy to have them muddy up their roof or beautiful view. Even worse this backlash is fostering more support for nuclear power plants. They don’t have to go in your backyard! I just wish somebody would think long term on this. Nuclear Waste. Nuclear Countries. Nuclear Weapon. Not sure we need more nuclear in our lives, especially if the alternative is just a solar panel. Maybe you have heard of DARPA, an uber-advanced military research group that created the internet, builds robots, and many other amazing innovations. the Department of Energy has created ARPA-E which stands for Advanced Research Projects Agency-Energy. A place to conceptualize and test the advanced energy projects of the future. Wireless sensors presents a massive new industry of tiny sensors that require little energy. They serve a simple function which is to turn on, send data, and shut down. They only turn on when activated and gather a specific amount of data to transmit. After transmission they shut back down. This allows them to be placed nearly anywhere and even form a mesh network. Activate one sensor that passes data and/or activation signal to the next one. In a few minutes you can have data from thousands of sensors. My brother wrote a dissertation on this using planes as an example. Place a sensor on all critical plane equipment. When the plane lands activate the sensors and get a status report on the plane. Wireless charging is coming. At the recent CES it was the rage. Consumer products are on the market. An MIT startup, Witricity, has several patents and deals with government, industry, and consumables. Hooray for the day when we are free from our cable jungles. A new material created in the lab with amazingly sophisticated microscopes that can be manipulated into a ridiculous array of uses. The presenter showed it as rope, tires, and even circuits. He passed around prints, stickers, rope, and cardboard made out of graphene. It appears to be the next gore-tex, or material than can be turned into anything. Cheap and moldable. It will be fun to see how this material is used.